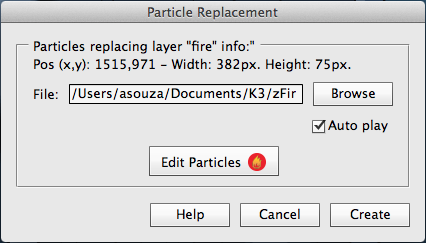 The Particle Replacement window allows you to configure a layer to render its content as particles created by Particle Designer and compatible external particle systems. Browse your folders and point to the particle File (.json) created by your system. If you want to automatically play the particles, enable the Auto play checkbox. Unchecking this option pauses the particles when the page start.